Jane joined the campus in October 2017, moving from Queen Mary, University of London. She is Professor of Geography at the Centre for Geography and Environment Science (CGES) and the Environment and Sustainability Institute (ESI) at the University of Exeter in Cornwall, UK. Her research interests focus on the changing geopolitical economy of work and regional economic development, new forms of urban political alliances including community organizing and living wage campaigns, and the politics and practice of localism in the UK. She has published widely, including Locating Localism: Statecraft, Citizenship and Democracy (Policy Press, 2016), Global Cities at Work: New Migrant Divisions of Labour (Pluto Press, 2010), Threads of Labour: Garment Industry Supply Chains from the Workers’ Perspective (Blackwell, 2005), Place, Space and the New Labour Internationalisms (Blackwell, 2001), Geographies of Economies (Arnold, 1997) and Union Retreat and the Regions (Routledge, 1996). 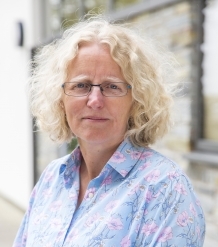 Her taught modules for CGES include The Geography of Cornwall (first year); the Isles of Scilly Fieldtrip (second year); Geographies of Democracy (third year); Democracy, Sustainability and Citizenship (Masters). Over the past two decades Jane’s research has covered three different themes: (1) The changing geo-political-economy of work, labour supply and labour politics; (2) New forms of urban political alliances with a particular interest in community organising; and (3) the politics and practice of localism in England. Previous projects include ESRC and Trust-for-London-funded research into the London living wage campaign; ESRC-funded research into low waged labour and innovative organizing strategies in London; and a Leverhulme Funded project entitled Politics and Place explores the history and practice of localism in England. I am the administrator for the new campus choir at Penryn, Kana Tremough! and staff can sign up here. Jane’s current research interests include the geography of political institutions, with particular attention paid to local structures and the ways in which people can engage in decision-making. This is part of her wider interests in devolution and localism, community organizing and civic innovation. Working in Cornwall provides new opportunities to explore the importance of local history and culture in underpinning and shaping political attitudes, engagement and activism. Wills J (2016). Locating Localism Statecraft, Citizenship and Democracy., Policy Press. © 2018, the Author(s) 2018. This paper draws on existing work in the discipline of human geography and cognate fields in order to develop the concept of the ‘geo-constitution’. This concept aims to: (1) highlight the importance of intersections between geography and political institutions in the constitution of government; (2) consider the path-dependent development of political institutions and their impact on statecraft and citizenship; (3) explore the implications of this for political reform. The paper provides an overview of current thinking in political geography and applies the concept of the geo-constitution to the example of devolution and localism in the United Kingdom. Wills J, Scott J (2017). The geography of the political party: Lessons from the British Labour Party’s experiment with community organising, 2010 to 2015. Political Geography, 60, 121-131. Full text. Wills J (2016). (Re)Locating community in relationships: questions for public policy. Sociological Review, 64, 639-656. Full text. Harney L, McCurry J, Scott J, Wills J (2016). Developing ‘process pragmatism’ to underpin engaged research in human geography. Progress in Human Geography, 40(3), 316-333. Full text. Wills J (2016). Emerging geographies of English localism: the case of neighbourhood planning. Political Geography, 53, 43-53. Full text. Linneker B, Wills J (2016). The London living wage and in-work poverty reduction: Impacts on employers and workers. Environment and Planning C: Government and Policy, 34(5), 759-776. Full text. Wills J (2015). Populism, localism and the geography of democracy. Geoforum, 62, 188-189. Full text. Wills J, Linneker B (2013). In-work poverty and the living wage in the United Kingdom: a geographical perspective. Transactions of the Institute of British Geographers, 39(2), 182-194. Full text. Flint E, Cummins S, Wills J (2013). Investigating the effect of the London living wage on the psychological wellbeing of low-wage service sector employees: a feasibility study. Journal of Public Health, 36(2), 187-193. Full text. Wills J (2018). Faith in action: Lessons from Citizens UK’s work in east London. In Pemberton C (Ed) Theology and civil society, Routledge, 19-44. Wills J, Horton A (2018). Impacts of the living wage on in-work poverty. In Lohmann H, Marx I (Eds.) Handbook of research on in-work poverty, Edward Elgar. Wills J (2014). Engaging. In Lee R (Ed) Sage handbook of progress in human geography, 367-384.